Anna Rierola believes that scientific discoveries have always had a profound impact on art. At the beginning of 2017, IRB Barcelona launched its Artist in Residence programme, which aims to bring artists who have an interest in science closer to researchers, data and infrastructure at the Institute. By fostering interactions between artists and scientists, the programme offers new opportunities for inspiration and reflection on both sides. Anna Rierola is the 2017 Artist in Residence. Stepping into Anna Rierola’s studio is like diving into a poetic and colourful representation of an aquatic underworld. On a wall hangs one of her pieces, entitled “Depths”. If you look at it from a certain angle, it could be taken for a nebula. Or even a continent as seen from a satellite. A trained eye, on closer inspection, will spot nanoparticles, a mouse embryo, cardiac muscle tissue, a retina, or even brain, kidney or liver tissues. 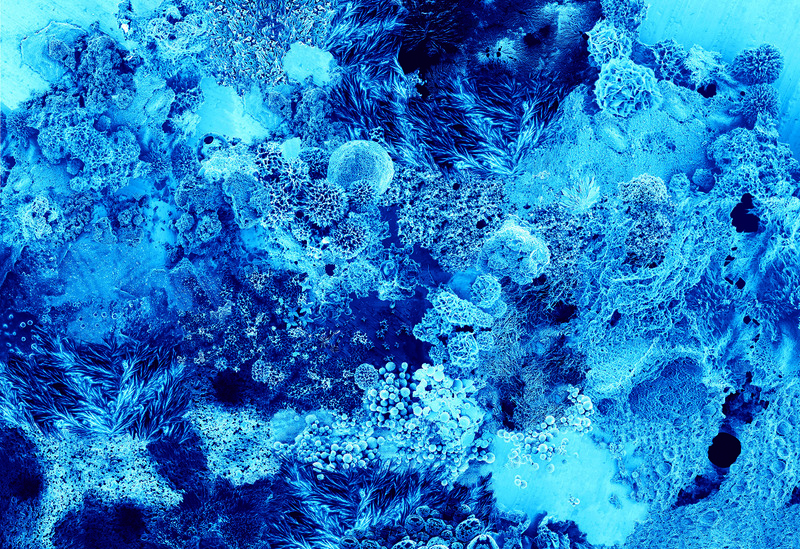 When brought together into a grand artistic collage, this artwork breathes new life into scientific images generated in research labs across Europe. A scientific image, she says, communicates much more directly than a mathematical or a chemical formula, which is difficult to understand without proper training. The Artist in Residence is currently visiting research groups and core facilities at IRB Barcelona to find out about their scientific experiments. “I want to understand what they do, so I ask them to explain it to me through their images,” she says. Artists and scientists interested in participating in the programme should contact the Office of Communications and External Relations for more information.